The repair of the anterior cruciate ligament is one of the most practiced sport interventions surgery. 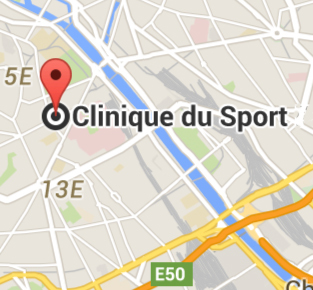 Increasing the French sport of the past 30 years, majorises trauma exposure, particularly of the knee. The frequency of ACL injuries in the United States is 250,000 per year LCA. In France, 35,000 ACL tears were made ? ?in 2007. The frequency of ACL tears varies by country from 70 to 85 ACL injuries per 100 000 population. 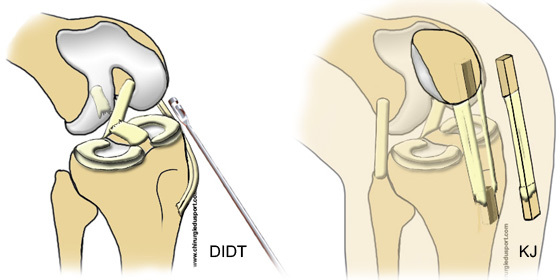 Many surgical techniques are possible to repair the anterior cruciate ligament. For twenty years, due to a better understanding of the semiotic laxity of the knee, orthopedic surgeons have improved ligament surgery technique. Currently, most surgeons use the patellar tendon or hamstring tendons. But other grafts are used: the fascia lata, the hamstring tendon graft in short, the quadriceps tendon and allografts. The best knowledge of the anatomy of the ACL has developed repair techniques dual beams also unifascicular for partial tears of the anteromedial and posterolateral bundle. Finally, the computer-assisted surgery is a technique using the ligament. We will successively address the various current surgical techniques ligament. The first ligament repair by direct suture of the ruptured cruciate ligament showed a failure rate of nearly 100%. The anterior cruciate ligament is the only ligament from the body completely intra-articular, it is not vascularized this partly explains the failures of these repairs. There are still some direct repair indications in ACL injuries by tearing the tibial spines with bone fragment, for which early surgical repair is successful. It's results prompted surgeons to find ligament repair techniques by tendon graft. Numerous techniques have emerged and their respective indications are progressively clarified. 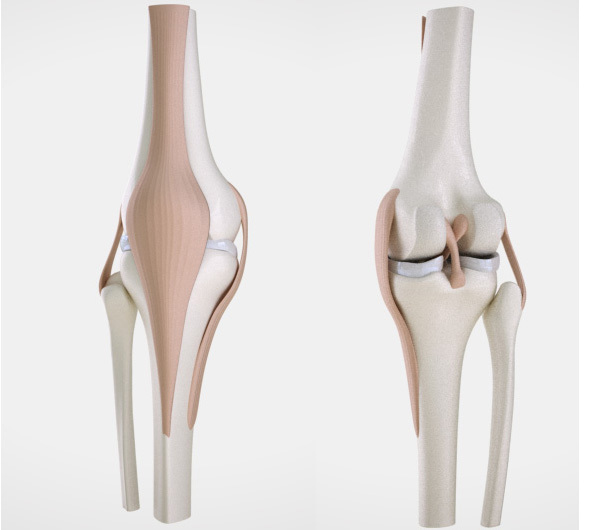 For twenty years, due to a better understanding of the semiotic laxity of the knee, orthopedic surgeons have improved ligament surgery technique. First open pit ligament surgery became all arthroscopic allowing better control of the positioning of the graft and the most effective treatment of meniscal or cartilage lesions. In 2006, according to figures from the HAS, 34550 ligamentoplasties were carried out in France, 15% were still carried out in the open. Earlier ligament surgery, most surgeons using the patellar tendon. Then other grafts were used: the fascia lata, hamstring tendons, and quadriceps tendon allografts. The best knowledge of the anatomy of the ACL has developed repair techniques dual beams also unifascicular for partial tears of the anteromedial and posterolateral bundle. Finally, the computer-assisted surgery is a technique using the ligament. We will address the various current surgical techniques ligament. 1) The technique of mixed Macintosh plasty intra- and extra-articular fascia lata Macintosh as amended by Jaeger. The fascia lata can be used as graft ligament but it must take a wide strip to be sufficiently resistant (Fig.1). The evolution of surgical techniques, especially arthroscopy has reduced the relative aggressiveness of the MacIntosh technique fascia lata. Only the sampling area of future graft ligament requires a conventional first "open". Postoperative rehabilitation allows first raised with support the day after surgery with a physical therapist, using a splint Zimmer to make the first steps and locking. From the first to the end of the 6th week, rehabilitation center or at home, labor mobility in assets and liabilities, primarily the extension and flexion. Frosting, sweet massages draining. Active labor lock, then walk with no cane. Spa, pool walking, from the acquired healing. 6 th week in the 3rd month: building closed muscular chain, walking, exercise bike, swimming: jigging, starting work in the open string without resistance and low resistance. 2) Ligamentoplasty bone-tendon-bone, Kenneth-Jones technique (KJ). The principle of operation is to repair the anterior cruciate ligament (ACL) with a broken bone autograft bone tendon taken from the patellar tendon. The procedure is performed under local or general anesthesia with a tourniquet to the limb. Incision 5 to 8 cm on the front of the knee. Sampling the central third of the patellar tendon with a bone rod at each end (Fig. 4). Preparation and transplantation calibration: it is necessary that the transplant is about 10 cm long and 9-10 mm in diameter. Drilling tunnels under arthroscopic control using two specific sights. The diameters of the bone tunnels are 9 and 10 mm to allow passage of the graft to the tibia and femur. Positioning of the graft, under arthroscopic control, with fixation of the graft by two resorbable screws or metal (titanium). Arthroscopy under control the correct positioning of the graft and the absence of conflict in the notch. Post-operative care: post-operative pain is controlled by regional anesthesia (femoral block), performed by the anesthesiologist and / or analgesic and anti-inflammatory medications. Rehabilitation is undertaken immediately after the intervention (up and running with splint and crutches like Zimmer, muscle toning and mobilization of the patella) Job Recovery full extension, soft mobilization in flexion and muscle toning muscles thigh. after the release from the clinic at a rate modulated as a function of the evolution, from 3 to 5 rehabilitation sessions per week. 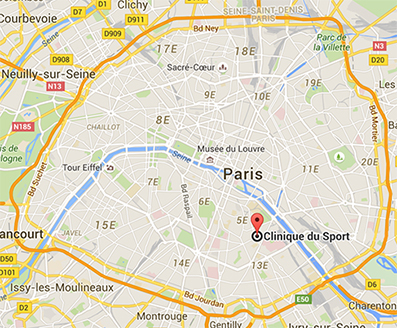 (City or rehabilitation center). Stopping the splint and crutches to the 4th postoperative week after checking the active locking the quadriceps. Normal operation and resumption of professional activity possible from the 6/8 th postoperative week to modulate depending on the occupation (later taken to a labor force). 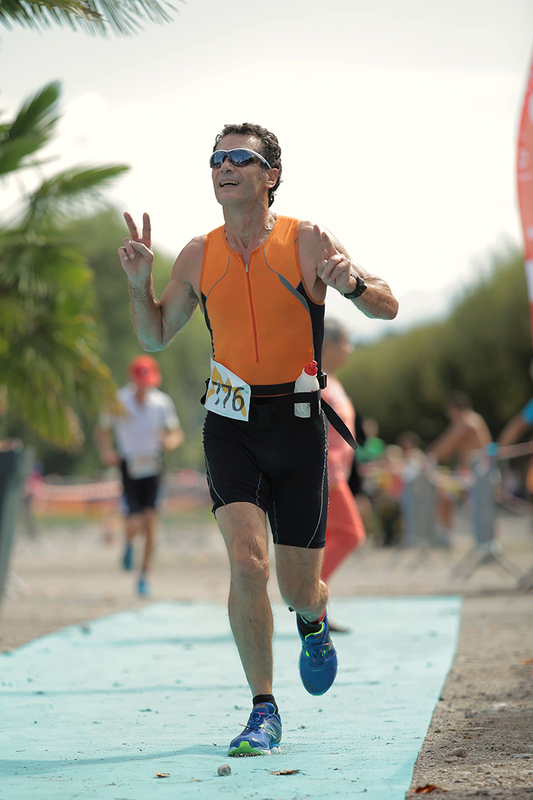 The resumption of the sport: swimming (front crawl, back) from the second postoperative month, bike from the 2nd postoperative month, light jogging with gradual increased efforts online, from the 4th postoperative month (flat). Resumption of training pivot in sports, from the 6thpostoperative month. Gradual recovery of competition from 8 th postoperative month. This sports recovery plan represents a natural evolution in the majority of cases. Recovery objectives are benchmarks to modulate depending on the evolution of each case. The aim of this operation is to achieve anatomic ACL reconstruction using autologous (patient's tendon) under arthroscopic control. ACL graft is autologous hamstring in (internal law and half tendon). Fig. 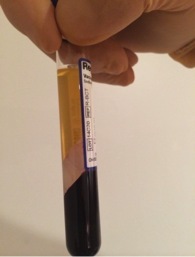 6 Preparation of the hamstring graft in 4 strands. Tendons domestic law and half tendon are thin (3 to 4 mm in diameter) and long (about 25 cm). They are the terminating two hamstrings ending on the crow's feet, they are palpable to the inside of the leg. The surgery is performed entirely arthroscopically. to carry out the drilling. The graft is passed from bottom to top in the two tunnels by a traction thread. She will take the exact place of the old ligament (Fig. 7). The fixation of the graft is the last step of the operation and probably the most important because it allows to wedge grafting (primary fixation) to the healing and organic integration of the latter in the bone (secondary biological fixation ). There are different methods: interference screws, EndoButton, staples or pins. 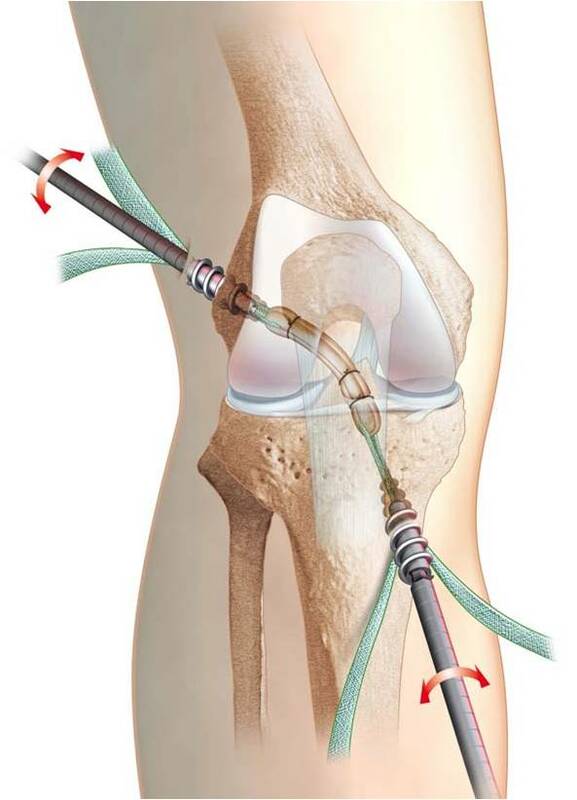 The goal is to have an excellent primary fixation, the surgeon will use the most suitable equipment for each knee. The next day, the resumption of walking in complete support possible. A splint simple protection and use two canes is desirable, not systematic. Rehabilitation is started on the first day. Finally a stay in a specialized rehabilitation center is not mandatory but may be desirable. A variable work stoppage, 2 months on average is usual. The recovery of a pivot sport is not possible before 6 months. 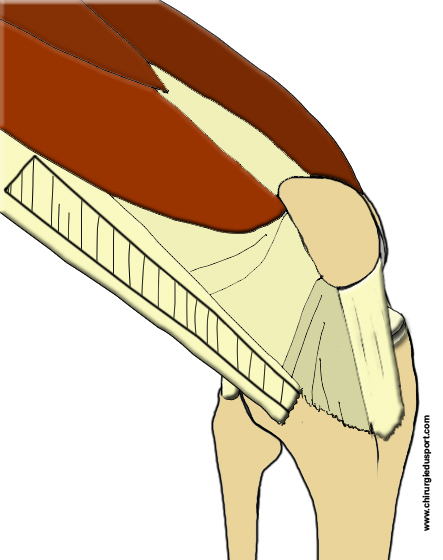 The tendon removal leaves a muscular body "orphan" who will likely adhere to its sheath. During this phase, the muscular body is fragile and overburdened, it may be responsible for painful phenomena type "breakdown." This is not a tendon rupture (levy in full) but rather an adhesion scar release. 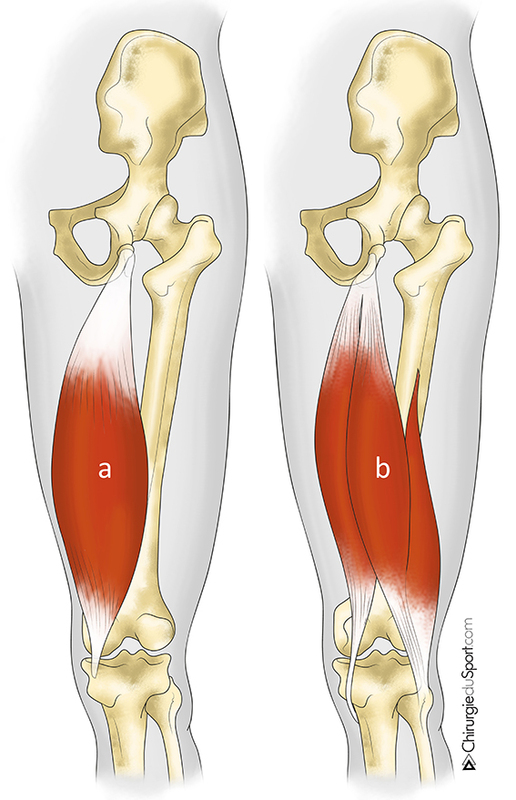 The principle of this technique is the same as the KJ or hamstring, only the graft-type exchange. Repair of cruciate ligament with the quadriceps tendon is rarely used first-line smoothly as possible. Most often, this is reoperation for failure or re-rupture of a ligament. The harvesting the graft is formed by an incision of 6 to 8 cm above the patella vertical or by two short horizontal incisions, one above the patella and the other 8 cm above. Take a bony knee pad and do not take the femoris tendon in order not to weaken the quadriceps tendon. 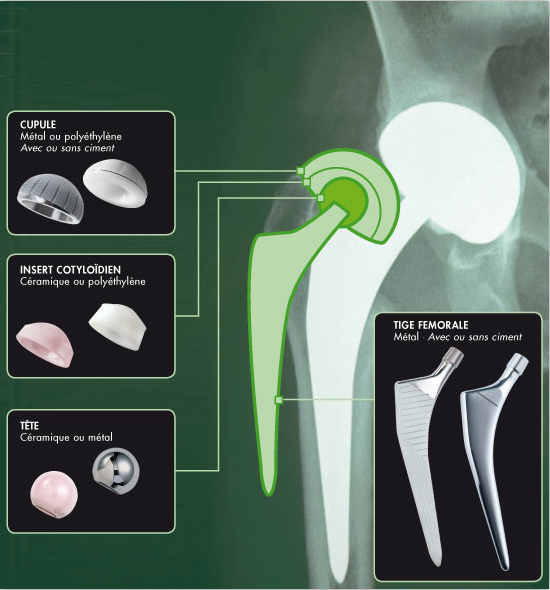 The operation is then performed arthroscopic conventional manner and the graft is fixed by screws, staples or pins. Rehabilitation is not specific but is close to that of KJ type of ligament. 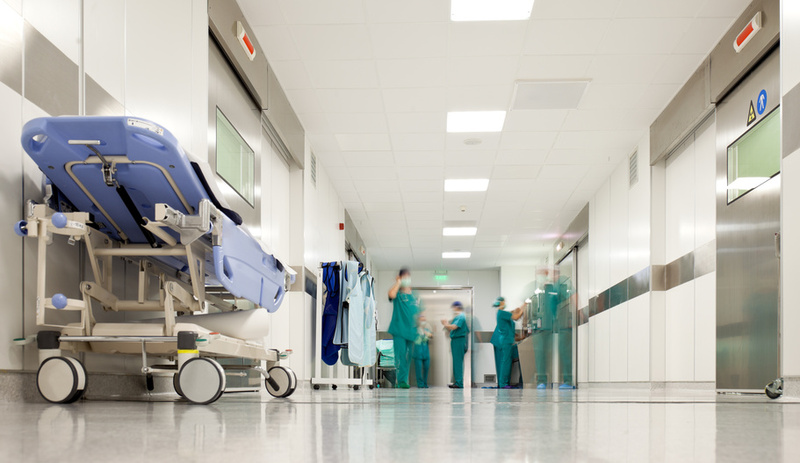 The use of allograft (transplant organ bank) is not allowed in France. Some French teams conducted recovery ligamentoplasties using allograft type of posterior tibial tendon and Achilles tendon. There are no technical specificity linked to allografts. The only difference is the absence of sampling with simpler immediate aftermath and no morbidity engraftment. However, integration of the graft is longer, it needs to extend the deadlines for sports recovery. In the US, the vast majority of first-line ligamentoplasties are performed with allograft. The aim of this operation is to achieve anatomic ACL reconstruction using autologous (patient's tendon) under arthroscopic control. The principle of TLS is to use a single hamstring tendon in short graft (transplant economy). 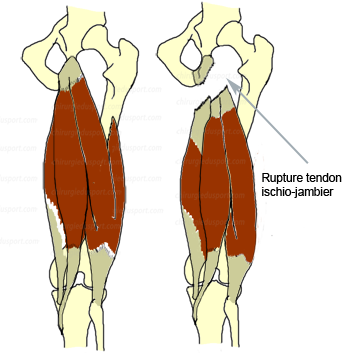 The half tendon tendon is one of two hamstring tendons (hamstring). It is thin (3-4 mm) and long (about 25 cm). It is the termination of the semitendinosus that ends on the bridle. The harvesting the graft is carried out by a short nearly horizontal incision of 2 cm to the surface of the tibia, is removed only the semitendinosus tendon over its entire length with a stripper. He bent over backwards to get a transplant ACL bundles 4 or 4 strands with diameters ranging from 7 to 9 mm. It's a short graft50 mm average length (Fig.8). At both ends of the graft are passed two textile strips for fixing the graft in tunnels. Using a traction table for performing a contention-graft 500 Newtons (Fig. 9). Fig. 8: Short TLS system Registry to 4 strands. The procedure is performed arthroscopically: two small incisions of 5 mm either side of the ball joint enable switch the camera and instruments to perform the ligament. The preparation of the notch allows the cleaning of the axial face of the lateral condyle and visualize the area well "over the top" in order to delimit the dial 9-12 and 12-15h for a right knee to the left knee. The femoral tunnel is drilled under arthroscopic control inwards with a specific femoral viewfinder. The knee is at 90 ° of flexion. Tunneling on the spindle diameter 4.5 mm is formed using the 4.5 mm drill. The femoral stall is then excavated using an auger to specific fins. The arthroscope is controlling the retrograde manual digging. The tibial tunnel is achieved according to the same principle. Tractors son went inwards in the femoral and tibial tunnels. The graft is then towed on his bandages and is positioned automatically in the femoral and tibial stall. The graft is fixed with two metal screws Titanium. Rehabilitation is undertaken immediately after the intervention without particular limitation. If the procedure took place without technical complications, the TLS system by mounting the mechanical performance are used to allow the immediate resumption of full support on the operated limb, splint according to the patient's abilities. Hamstrings can be processed into pure static without resistance. From the 3rd to 30th postoperative day: rehabilitation continued in the city or in the center: mobilization of 0 ° to 90 ° active in closed chain, working quadriceps co-contraction and hamstrings, canes can be dropped at the end of 8 to 15 days depending on the patient. Strengthening the quadriceps, with the end of weights or walk on the anterior tuberosity of the tibia, isometric and dynamic is prohibited. 2nd and 3rd postoperative month: walking is free. It must then fight against flexion. Bending is recovered gradually to 130 ° -135 ° in 4 to 6 weeks, without forcing. A work in dynamic and proprioceptive closed chain is started. After 3 months: work continued in closed chain, eg cycling, swimming (crawl), the pre-jogging. Working in open chain quadriceps with proximal load (2-4 kg) is possible from the beginning of the 4th month. Beyond 8 months, the patient can resume training pivot sports. The competition will be resumed after 9 months. Dynamic laboratory studies have shown that single beam ACL reconstruction was not able to correct the rotational laxity created by the ACL section. 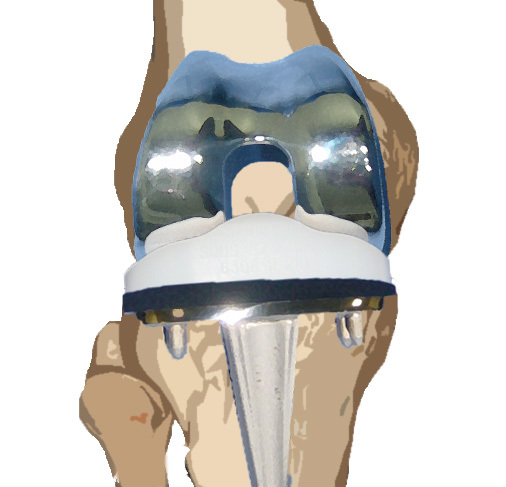 Repair isolated ACL allows it to control the rotational laxity and jump? There are two treatment options to limit the rotational laxity induced ACL: tenodesis fascia lata or TFL (Lemaire) associated with the intra-articular ACL reconstruction and Double tuck beam which seeks to replicate the normal anatomy of LCA. The lateral tenodesis fascia lata decreases the rotational projection by controlling the rotation of the inner side plate. This reduces the laxity of the lateral compartment and protecting the transplant during the phase "ligamentisation". The results show a better rotation jump control in plasties ACL associated with TFL. Plasty dual beam tries to reproduce the functional anatomy of the anterior cruciate ligament has two anteromedial and posterolateral bundles side. (Fig. 11). The anteromedial bundle is stretched during the whole movement of extension to flexion. The lateral posterolateral bundle relaxes during bending, the more oblique orientation from front to back and from within to without giving it a role in the control of internal rotation of the tibia on the femur. By reproducing these two beams, plasty 2 beam aims to improve control of laxity not only earlier but also rotation. She usually uses (for reasons of technical facility) hamstring tendons but sometimes the patellar tendon or quadriceps. In the United States, a large majority of dual beam ligamentoplasties are performed with allograft. Experimental biomechanical studies have shown a potential benefit to the use of this plasty but the first comparative clinical series show no significant difference with the classic tuck mono beam. Isolated rupture of the anterior cruciate ligament (ACL) is the most common ligament injury of the knee. This break is complete or partial. 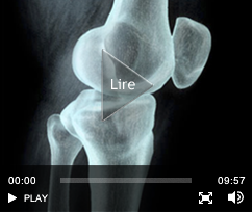 The clinical diagnosis of complete ACL tear is well codified and radiological appearance. However, the clinical description of a partial ACL tear is more difficult, and the radiological aspect and treatment. The LCA has two main beams: the anteromedial (AM) and posterolateral (PL). They both have an important role in the knee locking. The AM bundle is called "isometric", that is to say, it remains tense the knee is in extension or flexion, it is useful to control the anterior translation of the tibia on the femur, the knee in flexion or in extension. The posterolateral bundle is less "isometric" that is to say, it is stretched but relaxed in flexion extension, it is useful to control the anterior translation of the tibia on the femur, the knee extended. Its oblique orientation allows better control of rotations. The position of the knee at the time of trauma might explain a preferred lesion of one of the two beams. Theoretically, a rupture of the AM bundle should lead to laxity in flexion, to stable knee extended and the absence of clinical rotation anomaly. The isolated tear PL beam should theoretically result in anterior laxity in extension, an increase in internal and external rotation in extension. MRI diagnosis remains difficult. The usual sections of standard MRI does not analyze well the forward structure of the two beams. The value of MRI 3D (three dimensions) for better identification of the two beams is very useful. If diagnosis of partial ACL tear, conservative treatment can be offered. It is variable combining the use of a splint, rehabilitation, muscle strengthening. The time allowed sport recovery is three months. Wearing a splint has not proven its effectiveness in the prevention of progression to a complete break with the resumption of sporting activities. Fig. 12: partial repair of the anteromedial bundle. the partial anterior cruciate ligament is difficult. It requires a thorough knowledge of ligament anatomy (position of the anteromedial bundle or posterolateral) and a mastery of the surgical technique. The repair rate of partial ACL tears varies from 15 to 25% depending on the teams. Most often, the hamstring graft is used (2 tendons). The short graft technique using only a hamstring seems more anatomical for these partial ruptures. Must be used in this case half the tendon to the AM bundle and domestic law for the PL bundle. Some teams use the patellar tendon for these partial ruptures. The beginnings of ligamentoplasty computer assisted knee date from the 90. The failures of ligamentoplasties most often linked to poor positioning of the tunnels have pushed the teams to ligament surgery desktop. In conventional arthroscopic surgery, the correct positioning of the tunnels in the knee depends on the surgeon's experience and used specific sights. Most of the time, these viewfinders are used independently at femoral and tibial tunnels by positioning the insertion of native ACL. 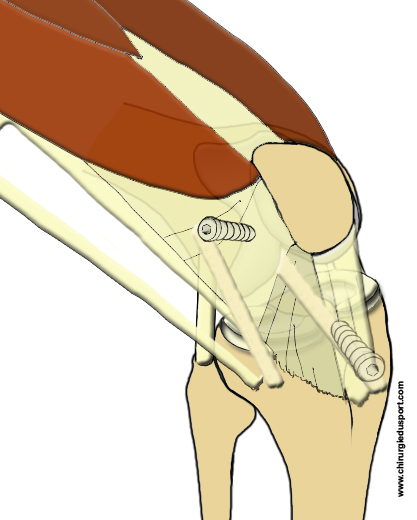 The purpose of computer-assisted surgery is to help the surgeon to position the two tunnels respecting the anatomy of the knee and the isometric ligament (lack of elongation of the graft flexion / extension). The sighting of the two tunnels is no longer independent. Computer-assisted technique requires a binocular camera with infrared sensors attached to the tibia and femur, specific instruments with sensors (gauges, viewfinders tibial and femoral ...) and the infrared camera is following the sensors in space. Before performing the surgery must be performed instrument calibration, positioning them in front of the infrared camera that will be able to recognize them throughout the course of the intervention. Then the two femoral and tibial rigid sensors are fixed in the femur and into the patient's tibia. They will be tracked by the infrared camera thus locate the respective location of the femur and tibia during surgery. The identification of anatomic points is achieved either by prior knee reconstruction in 3D scanner or by the method of Bone Morphing (system which produces a 3D model of the joint after having digitally recorded a series of points to the bone surface ). By movements of flexion / passive extension of the knee and knee drawer maneuvers, the computer records the dynamic knee anatomy. From all scanned data, you can select the ideal location of the femoral and tibial bone tunnels to optimize intra-articular placement of the graft and its isometric. This technique can be used with all grafts and bindings exist and is performed arthroscopically. 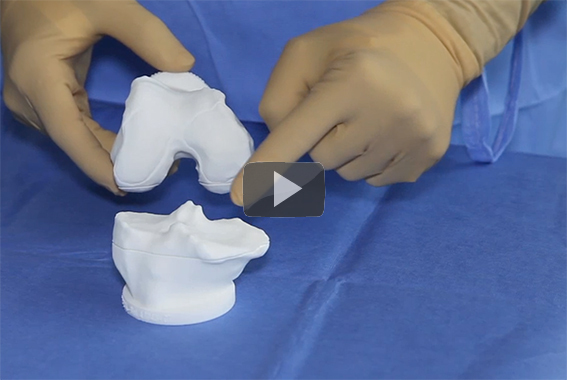 The different experiences suggest that with this technique, we are improving the graft placement, minimizing conflicts with the intercondylar notch and the axial faces of the condyles. There is also a better estimate of the isometric graft. However, no study has been able to show a significant improvement of the results of computer-assisted ACL reconstruction. 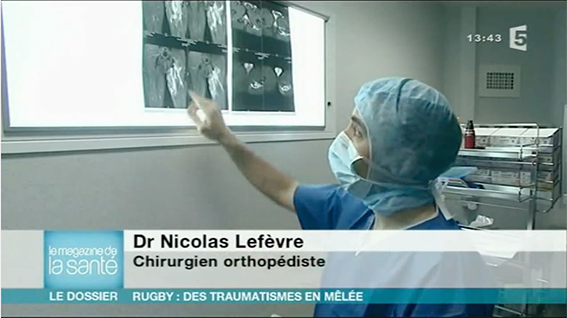 Currently in France, the majority of ACL reconstruction is performed according to KJ or hamstring technique. Both transplants have a mechanical strength greater than that of a native ACL. The bone-tendon transplant bone patellar has for him the reliability of the bone-bone attachment in the tunnels, but against the risk of persistent anterior knee pain. The transplant hamstring has for him the appearance of the scar, postoperative usually simpler but a residual laxity in most important rule. There are currently no recommendations on the choice of transplant based on scientific considerations. Recent studies with proper methodology to conclude that the results are very similar. The tendon-bone fixation for hamstring, is the weak point of this technique, especially the shin. A remote distal cortical fixation confers high resistance to tearing but high elasticity highlight the cyclical tests. A proximal fixation in the tunnel (for example interference screws) reduces the "free" length of the transplant and thus its elasticity. It is necessary to cycle the transplant by 50 flexion extension to be closer to its final elastic elongation. It is desirable to use at a tibia joint fastening in the tunnel (screws) and distal (clip or washer) in order to stiffen the system. The advantage of the short graft and TLS fixation is to have a greater resistance to tearing and a lower elasticity of the assembly. The pre-tensioning the graft TLS lets not make knee cycling since the transplant already have its final elastic elongation. The fastener is rigid with the locking strips in the bone tunnels with the titanium screws. In reality, each technique has its advantages and disadvantages, all studies show similar results. The key to success is not the choice of transplant but the good positioning of the graft: 2/3 ligament failures were secondary to poor positioning of the tunnels. The initial tensioning and especially the strong and stable primary fixation in time is essential. 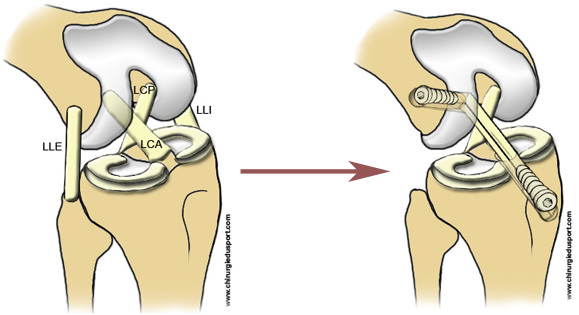 The evolution of the ligament of the knee has in 40 years to change the indications and techniques of this surgery and the choice transplants. Thus, the results have improved significantly although they are still imperfect. Many techniques have been developed but few are transplants and used the correct technical positioning and strong fixation of the transplant are the essential elements for the success of the ligament. The use of navigation improves this positioning. 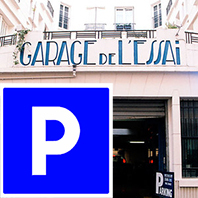 The use of allogeneic (not permitted in France) limit the levy-related pathology. Plasty double that upper beam in experimental biomechanical studies show no significant difference with the classic tuck mono beam in clinical studies. Finally, the best knowledge of the anatomy of the ACL and advances in imaging (MRI cube) helped develop unifascicular anatomic ACL repair techniques. Doctor Nicolas LEFEVRE, Doctor Yoann BOHU, Doctor Serge HERMAN. - 3 janvier 2015.